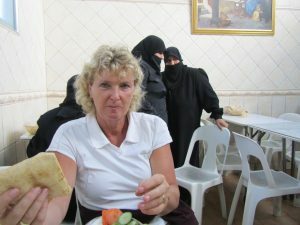 Jordan formalities were fast and efficient; Syria was chaotic and very disorganized. Three hours later we had our Visa, Carnet stamped, Insurance organized, diesel tax paid (100USD for one week) and passports stamped. Everything in triplicate and we always wonder what happens to all this paperwork. One hundred kilometres to Damascus through a fertile agriculture area. 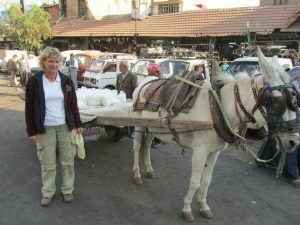 Damascus traffic reminded us a little of Dar Es Salaam, Lusaka and Kampala. No different than the Syrian border crossing. Chaotic – Police and Army personnel everywhere, but we are not sure what they really do. We travelled north along the Golan Heights, which is a UN Controlled area. At 5pm it was already totally dark, and we are now aware that we are closer to Europe. 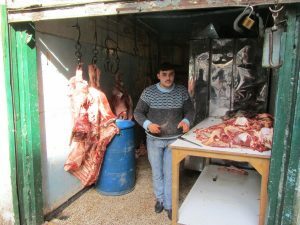 A few minutes later our friend the Imam welcomed us as we entered the garden camp area of the Syrian family who own the New Kaboun overlander campsite in the outer suburbs of Damascus. So, I suppose another early wakeup call tomorrow morning. 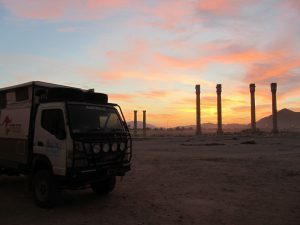 A very chilly night and last night we spent the evening inside the truck. I suppose from now on this will become the norm. The sun was up early, and it only took a few hours to get to 22 degrees again (10am). At Midday it reached the Max of 24 degrees, which for us has been the coolest day for months. 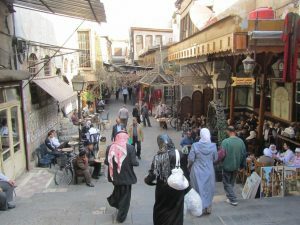 Damascus is divided in 2 parts; the Old City and the area around the Old City. 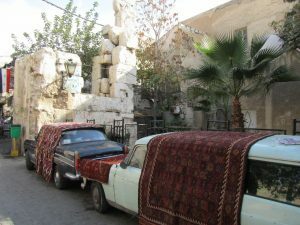 The Old City is the part of interest to every tourist and it is still partly walled. 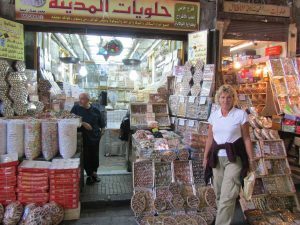 We entered the area via the Souq Al Hamidiyya, absolutely everything is for sale here. 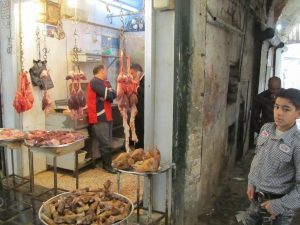 This huge market leads to the heart of the Old City and the Umayyad Mosque. 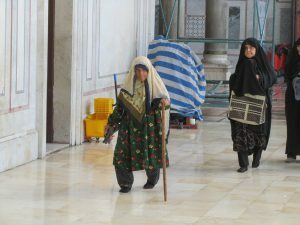 The Umayyad Mosque is one of Islam`s most important buildings. 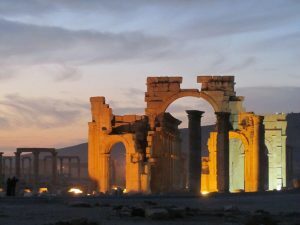 Therefore, it is Syria`s most significant religious structure. 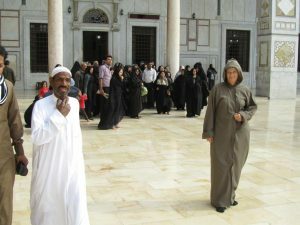 After the Mosque in Mecca and Medina (Saudi Arabia) it is the third most important and has a history that exceeds the Mecca and Medina Mosques. 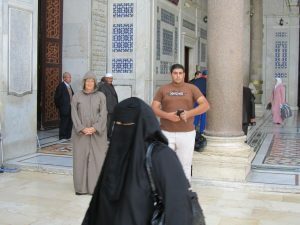 Non-Muslims can visit this Mosque and women are also welcome, so we decided to enter. But Clary had to wear a hooded cloak. 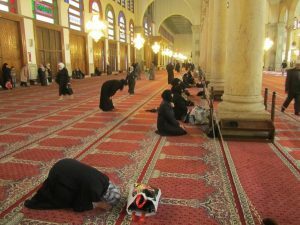 As in any Mosque, we were required to take off our shoes. Unlike other Mosques, we were allowed to take photographs. 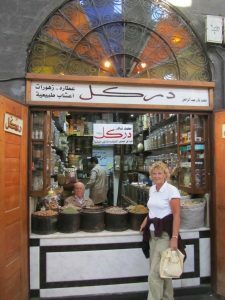 After we left the Umayyad Mosque, we had coffee in a 200-year-old coffee house. 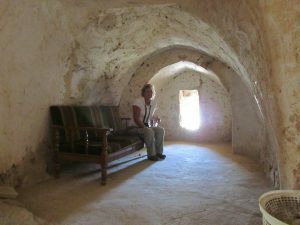 In fact, the part behind the Mosque had many coffee houses. 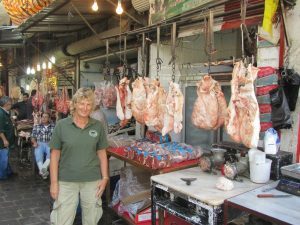 And we couldn`t go past the beautiful lunch shops all with perfect smelling meat. In the end we ate far too much and as we started to feel tired at around 3pm, we called it a day and took a taxi back to the camp ground. 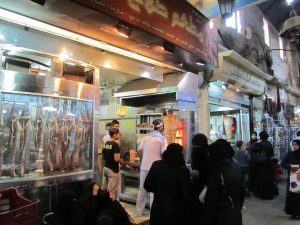 In all, Damascus is a beautiful city, with a sophisticated CBD and a vibrant nightlife. 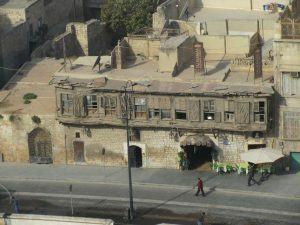 The Old City remains the Old City and beside the Souq has some beautiful old houses. 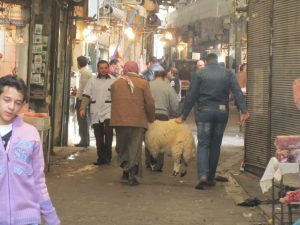 For us, Damascus is a must and even though we do not like large cities, this one was not to be missed. 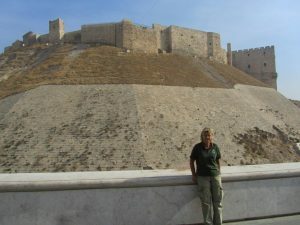 Unfortunately, the Citadel was closed, so we didn`t get an opportunity to visit. Arriving at the border of Lebanon we received the bad news that we will not be allowed to enter Lebanon. The reason being that foreign cars that are powered by diesel are not allowed in? 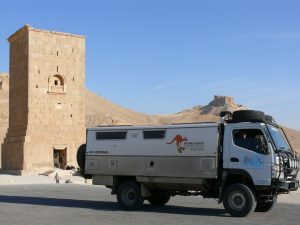 Instead of trying to fight the refusal even though we have enough diesel to cover Lebanon without refilling, we decided to travel east towards the Iraqi border and visit Palmyra. 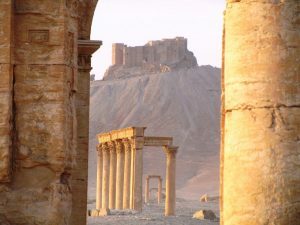 Palmyra is Syria`s prime attraction and one of the world`s greatest historical sites. 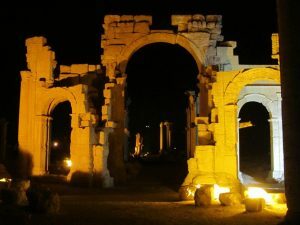 The ruins of this second century AD city cover some 50 hectares. 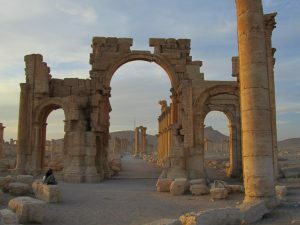 From Damascus, it is a 200 plus kilometres of desert crossing with nothing but sand and stones. 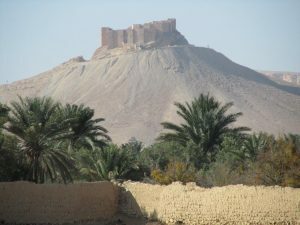 Palmyra is in the centre of the Cham Desert, not far from the Iraqi border. 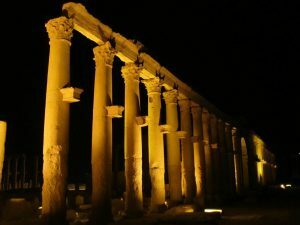 The road from Damascus was good and it only took us three hours to get here. 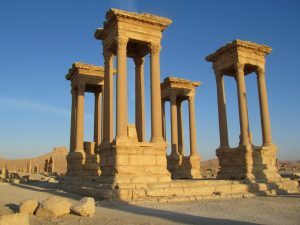 Palmyra is also called the city of a thousand columns. 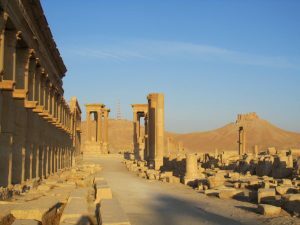 And once you walk the great colonnade, which stretches more than 1000 Meters, you realise why. 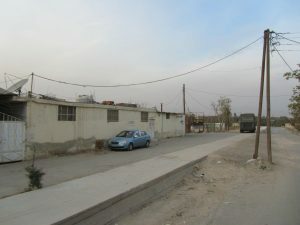 It will also give you a clear impression of the layout of the city. 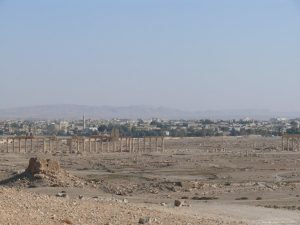 Palmyra also has ancient tombs on the slopes at the east side of the city. 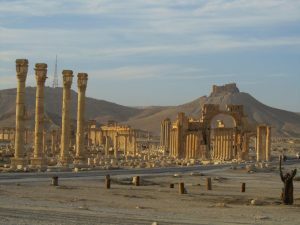 Palmyra is a remarkable site in the centre of the Syrian Dessert. 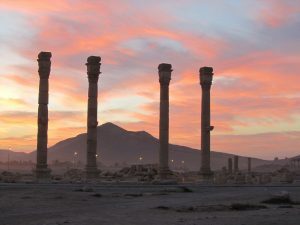 This city became a necessary stopping place for caravans taking the shortest route from the Arab Gulf to the Mediterranean, as well as those taking the silk route and crossing the Tigris in Babylon. 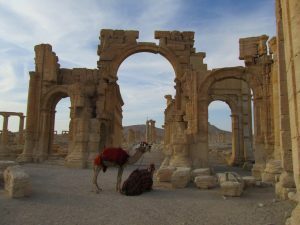 Palmyra goes back to the 19th century before Christ. 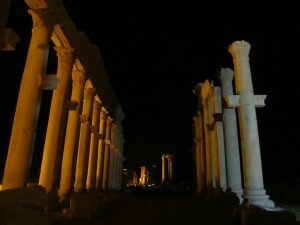 At night the whole complex is lit and with no fences we were free to wander anywhere. Sitting in front of the truck tonight the view was amazing. 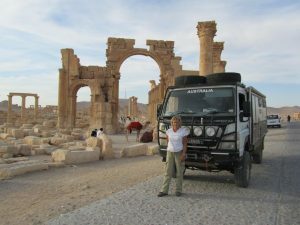 We met up with Klaus Schier and Sonja Nertinger, the authors of Overland travel books and documentaries, who are also traveling overland around the world. 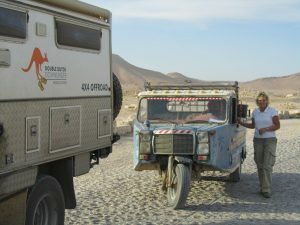 Best known for their travels from Alaska to South America, and from Europe to India, in total, over the past 16 years they have travelled overland through more than 60 countries. An Amazing place and 4 days was not enough. I had a rotten night and spent most of the time on the toilet. Not sure what it was but it lasted the whole day. 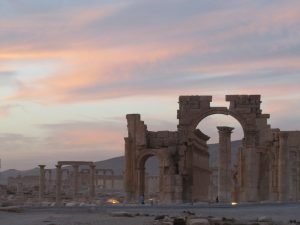 We went in the morning (1 degree) to take some photos of the sunrise over Palmyra. One morning I decided to stay in bed as I felt sick. Since South Africa (Lesotho) this would have been our coldest night. Europe is not that far away! 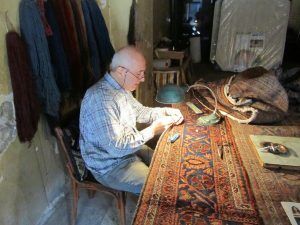 We have been warned to expect snow once we reach Cappadocia in Turkey. 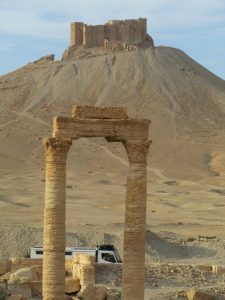 After we visited Palmyra in the morning, we decided to leave because the icy cold wind did not make walking a pleasant event. Further to this, I really didn’t feel very well. 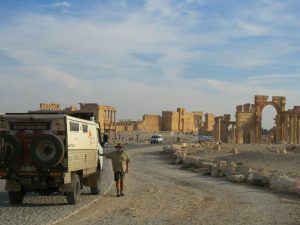 Our journey north takes us from the oasis town of Palmyra along the desert fringes to Aleppo. 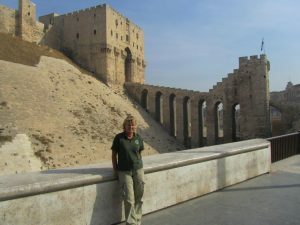 Our first destination was Homs, a city in the west of Syria south of Aleppo, it is the 3th largest city in Syria the major tourist attraction in the area is the Krak des chevaliers a world heritage site and one of the most important preserved medieval castles in the world 45 kilometre out of Homs. 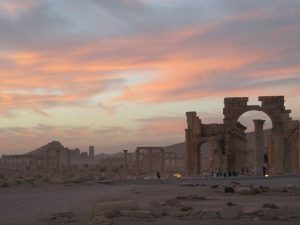 Aleppo will be our last port of call in Syria. 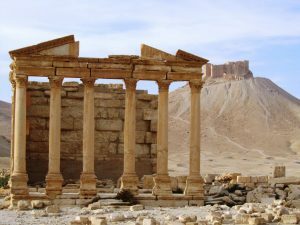 It is the second largest city of Syria and since Roman times has been an important trading centre between Asia and the Mediterranean. 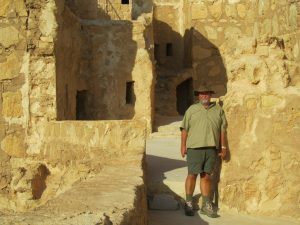 We visited the covered Souqs, the Citadel, museum and caravanserais (merchant inns). 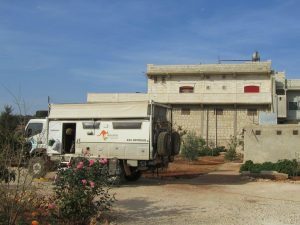 We were told that a Belgian lady, who is married to a Syrian, has opened a campsite in her back yard about 25km west of Aleppo. This will be our stop for tonight. It is funny how quickly you get used to people with guns, Toyotas with machine guns on the back and people in civilian clothes manning road blocks with machine guns! Early afternoon we arrived at Salaam Camp ground. I still felt sick so decided to have an afternoon nap and by 5pm it appeared that the worst was over. I was starting to feel a little better. 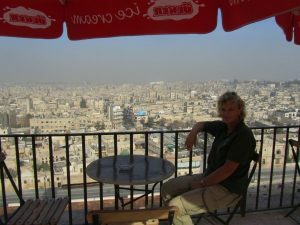 We took a taxi bus to Aleppo 25km away and about 20 minutes driving. 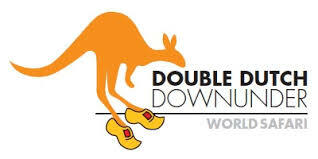 It cost 0.56 AUD cents return for two people. 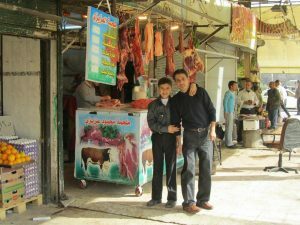 We needed to do some shopping at the markets and we wanted to visit the Aleppo Citadel and the Mosque. 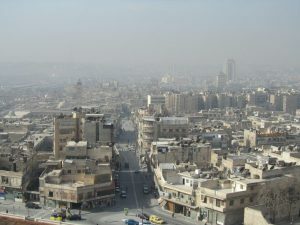 Also called Halab, Aleppo is the largest city in Syria after Damascus. 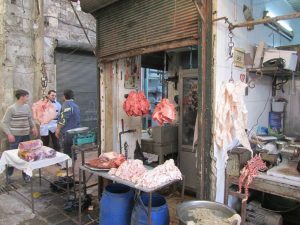 Thirty percent of the population of Aleppo is Christian. 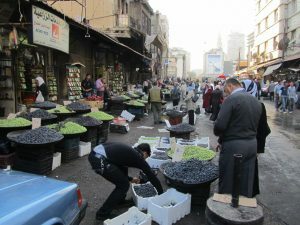 The Souq of Aleppo is one of the most well known in the world; it stretches over 12km and is the largest in the Orient. 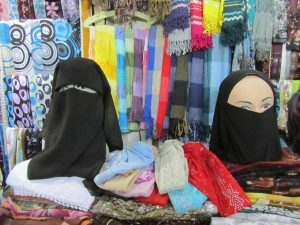 The Souq is amazing and there is so much to see. Hence this is where we spent lots of time. 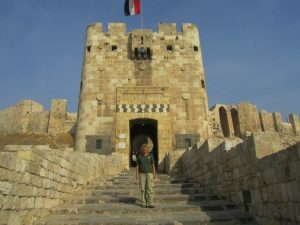 After we left Aleppo, it was a short 30-minute drive to the Syrian and Turkish border. 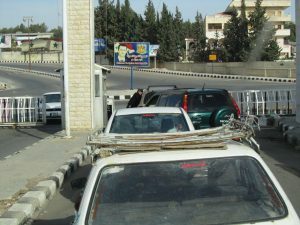 The northern Syrian Bab al Hawa border crossing was clogged with Turkish trucks but for us we got through the red tape a lot faster and it appeared to be a lot better organized compared to when we came in via Jordan. 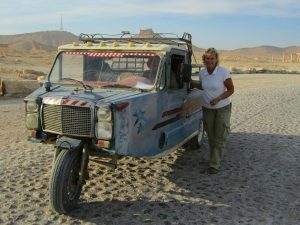 However, no-one would sign the Carnet before we paid out another 50 USD plus another 10 USD for the car. 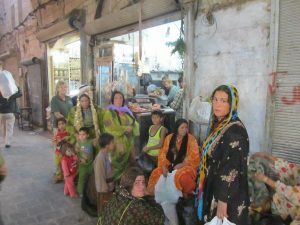 Unbelievable – they do not even except their own currency and demanded US dollars (the country they hate so much). 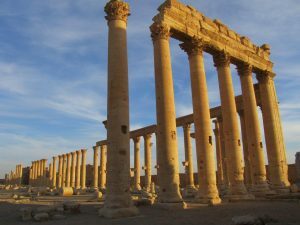 So, Syria cost us in USD $223 to get in plus Diesel Tax, Insurance and Visas plus departing around 60USD after negotiating. Turkey was easy, organize Visa, stamp in your passport and your vehicle details and off you go. Little did we know that weeks after we left the violence rapidly escalated and became a full-scale civil war that has left more than 450,000 people dead. More than five million people have fled Syria according to the UN. 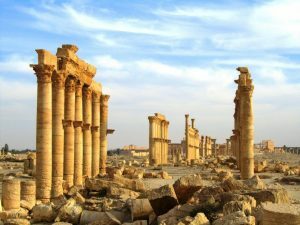 What began as a peaceful uprising against Syria’s President Bashar al-Assad six years ago, devastated the country. 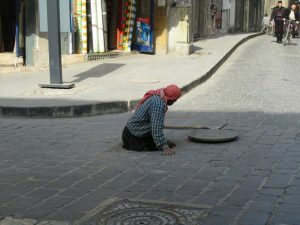 During our month in Syria many Syrians complained about high unemployment, corruption and lack of freedom of speech. 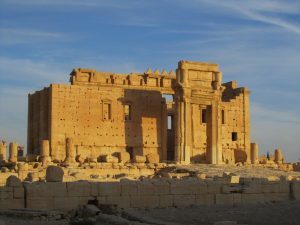 The violence rapidly escalated and the country descended into civil war as hundreds of rebel brigades were formed to battle government forces. Looking at the photo’s we wonder what happened to all those people in our pictures. 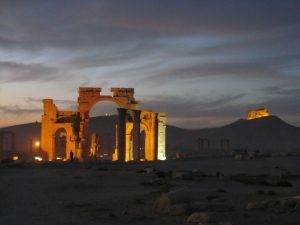 Syria is now involved in one of the worst civil wars in modern times. 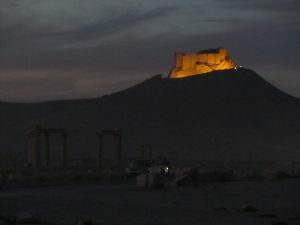 A fight is between Syrian Government forces, Islamic rebel forces and ISIS fighters. 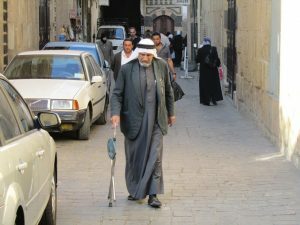 Over 4 million Syrians have now left Syria. 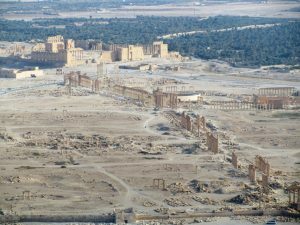 Now in it seventh year it looks like ISIS have lost all strategic area’s in Syria, but not without doing tremendous damage to areas such as ancient Palmyra, killing many including the director of the Palmyra museum. 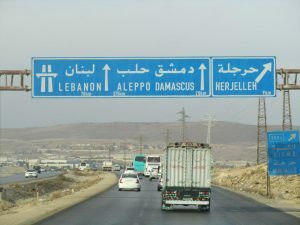 (beheaded) The other 2 cities which became major battle grounds away from Damascus, were Aleppo and Homs. 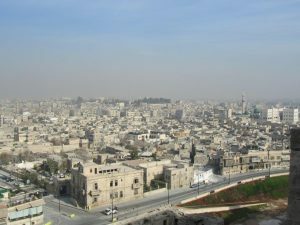 Aleppo was once Syria’s largest city, with a population of about 2.3 million. It was also the country’s industrial and financial centre. 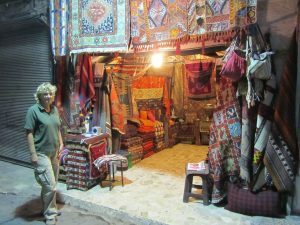 The old city is a UNESCO World Heritage site and was famous for its 13th Century citadel, 12th Century Great mosque and huge covered markets, or souks. 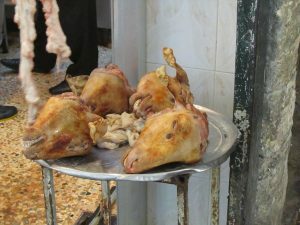 Homs, an ancient city where Christians and Muslims used to live in peace, and where neighbours now are killing each other. And many families fell apart. 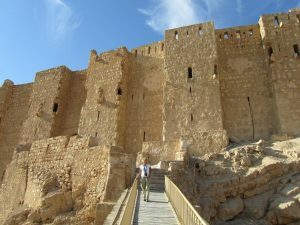 From all accounts Krak des Chevaliers has received little damage from the outside (except bullet holes) and fire damaged black pillars, and the limestone blocks have been replaced or put back in position. However inside it appears lots of damage is done including a lot of looting.